The next ingredient is blueberries, aka “brain berries”. The dark color of blueberries is from anthocyanins, which are antioxidants that boost brain function. Antioxidants neutralize free radicals and prevent them from damaging cells in both the body and brain. Blueberries also contain flavonoids that are capable of crossing the blood-brain barrier. Flavonoids may help improve learning and memory by enhancing communication among brain cells, and some experts even speculate that they may stimulate the growth of new brain cells. 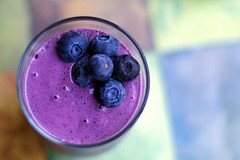 Flavonoids in blueberries also provide anti-inflammatory action in the brain. High in antioxidants, serotonin and dopamine, bananas are a natural fit for this smoothie recipe. Serotonin improves mood and helps control appetite, memory and learning while dopamine boosts attention and memory. Goji berries are also an antioxidant powerhouse and help our bodies produce Choline. An essential nutrient that combats free radical damage associated with neurological degeneration and Alzheimer’s disease. Last, but not least, hemp seeds. The essential fatty acids omega-6 and omega-3 found in hemp are vital for optimal brain health. Compounds in hemp seeds have also been shown to promote memory and learning. Not only do the five ingredients for this smoothie boost your brain health, they also taste great in combination! I would love to know if you try this brain booster smoothie – please leave a comment below. Happy Blending! This is an amazing drink! I added ginkgo root drops and peppermint oil as ginkgo has been shown to increase brain function and peppermint concentration. Absolutely love the ginkgo root drops and peppermint oil add-ons! Both are powerful brain boosters. Where can you get these ginkgo roots or drops from? I assumed James meant ginkgo tincture. Herb Pharm is a producer I like. I am confused as to why add Juice. Concerned by the added sugar unless from the natural fruit itself. Any other liquid substitutions? That’s an astute concern. Typically, I don’t recommend juice because of its high sugar content, but in this case I call for fresh pressed or juiced with a juicer, meaning you’re making your own juice at home. I don’t see a problem with doing this occasionally. If you’d rather not use juice, water, tea, or milk will do just fine. Coconut water. Yummm. I also added Maca powder and a little flaxseed meal. Really nice balance on this smoothie. Thanks! My husband is suffering from severe memory problems..not sure what the diet should be.. Thank you for this great recipe! It would be so useful if your smoothie recipes were on Pinterest! Hi,I was wondering if I can drink this brain boosting smoothie.I have type 11 diabetes and this smoothie is high in carbs and sugar but it is healthy to drink.I will make it for my mom soon. It’s probably too high in sugar for you, Kim. Replace the banana with avocado and apple juice with water to reduce sugar and carbs. I will use water,and the avocado and stuck to the rest of the ingredients to make this smoothie in my blender soon.would it still give me the same healthy benefits for my brain?I will make it for my mom as well and I will let you know how much I enjoy your smoothie. Yes, it will still benefit you and your mom’s brain, Kim.